Inspired by the pioneering efforts of our Ugandan partners to combat these effects and recognising the contribution made by our lifestyles in the UK, we joined forces with them a few years ago. It all started with a visit here by 6 environmentally active Ugandans, which led directly to clean energy and agro-forestry projects in both Kamuli and Ngora. The new Solar Power Installation in Ngora, part-funded by the Wales Africa Community Links (WACL) programme, is a real asset to all our projects. There is no grid electricity in Ngora so life at the Goat Unit has been transformed for lighting, livestock laboratory work, water pumping and internet connection. It is great for all the training that takes place there and we couldn’t have contemplated our music recording project without it. 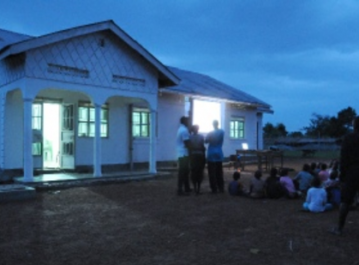 But the benefits are not only practical – it also powers a donated projector so Ngora now has its own “cinema” and people come from far and wide for the only entertainment of this sort in the area (see picture below). THE GOAT UNIT AND LOCAL CINEMA! The Biogas Installation for the kitchen of Busoga High School in Kamuli (also part-funded by WACL) has drastically reduced the amount of firewood needed and the smoke caused by the open stoves which can cause serious health problems. The improvement in the school latrines is another big advantage, especially for the girls. 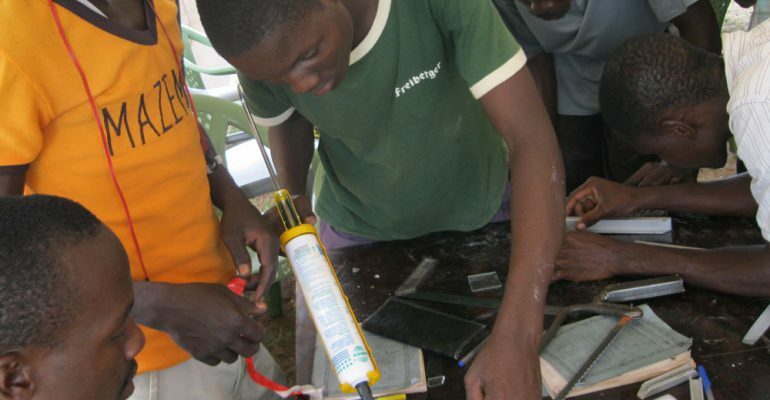 Moses Kitimbo has appeared on Ugandan television to promote the use of biogas from latrines. We have also helped to fund the training, manufacture and installation of fuel-efficient stoves both in Kamuli and Kumi for home and school, boasting the same environmental and health advantages of biogas. Last year we embarked on a most promising project in Ngora and were delighted to receive a grant from WACL to start it off. 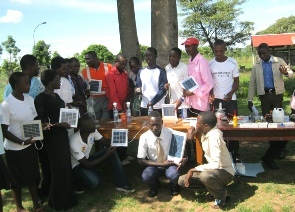 This was used to train 25 young people in the manufacture and installation of solar panels, the smallest of which will power a single light and others will power batteries, simple equipment, possibly computers etc. At present the only form of electricity in Ngora (apart from the PV panels on the Goat Unit roof) comes from paraffin or diesel, which is unhealthy, often dangerous (causing many fires) and of course hugely damaging for the environment. Training by the Mount Elgon Self-Help group was successfully completed in November 2014, and participants can e seen in the photo below. A very generous donation has bought workshop premises and a grant from Hub Cymru Africa has assisted in the process of getting the factory fully functioning. We are currently raising funds to equip it and bring it up to the required standard. The young people trained are raring to go and we are confident this is going to be a most successful social enterprise, with profits being invested back into the community. It is a real win-win situation for the environment as well as employment prospects in Ngora; both for the young people trained and the people who buy the panels; assisting in opening up opportunities for enterprises. Buying the panels, which will cost less than two-thirds that of imported panels can be facilitated by micro-credit schemes or barter of livestock or crops.